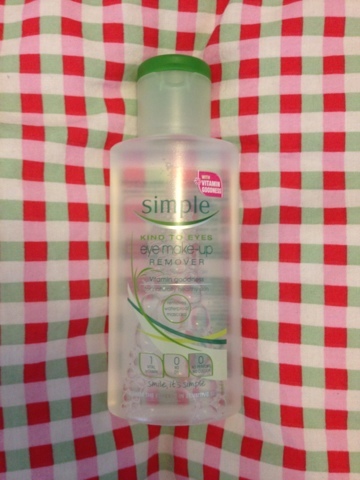 I have been trying to re-vamp my cleansing routine recently, I use wipes most of the time but I know these aren't great for your skin, so on a little wander around Boots recently, I picked up Simple Kind to Eyes Eye Make Up Remover because I wear Black Eyeliner and Mascara on a daily basis so I wanted a product specifically targeted for the eyes, one because my eye's have a tendency to be a little sensitive to some products so I was hoping that something targeted for sensitive eyes would be designed with that in mind and secondly because it does normally take quite a lot of work to remove my eye make up each day so I wanted something specifically targeted for that reason as well. The product was quite well priced, I picked mine up in Boots for £3.35 for 125ml bottle which seems like a pretty fair price to me. I used cotton wool to remove the eye makeup and all was OK to begin with, it took quite a lot of scrubbing to get all the make up off but I can forgive this on the basis that I do wear a lot of eye make up each day but it did mean that my eyes felt a little tender. About ten minutes after using this however, My eyes began really stinging, almost inside the eye, which meant that I was wondering around squinting and wanting to wash my eyes with cold water to relieve the stinging, once I did this, it seemed to soothe them and they began to go back to normal, had I not have washed them, I'm not sure how long I would have had to put up with it though. Personally, I'm quite disappointed with this, but I know lots and lots of people love this product and it has won lots of awards, so I think it may have to be a test it and see if it works for you. I am now on the hunt for an eye make up remover that works (and hopefully doesn't sting!) What do you guys use? 3 comments on "Simple Kind to Eyes Eye Make Up Remover"